Right after my wife and I got married, we moved to Raleigh, NC where we lived for almost seven years. During that time, I learned a great deal about Eastern North Carolina-style barbecue. First, let me get the definitions out of the way. North Carolina has two entirely different styles of barbecue: Lexington-style (sometimes “Western North Carolina-style) and Eastern North Carolina-style. 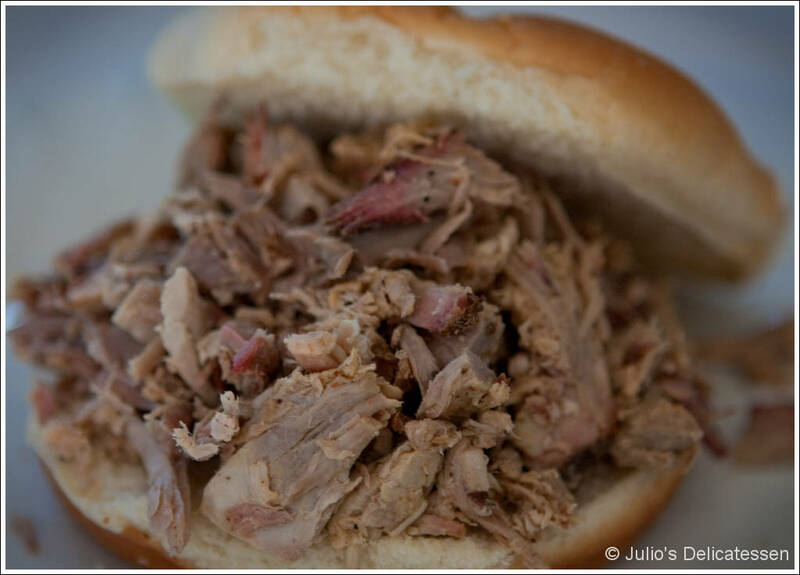 Eastern North Carolina-style features slow-cooked pork (whole hog or shoulder only) with a vinegar-based sauce. Lexington-style uses a tomato-based sauce. In addition to living in Raleigh, my job provided many opportunities for me to head “down east” to Wilson, Rocky Mount, Tarboro, Greenville, etc. As a result, I sampled some of the best barbecue that the region had to offer (Bill’s in Wilson, Parker’s in Wilson, B’s in Greenville, Wilbur’s in Goldsboro, Pete Jones in Ayden, etc). I also have a good friend with a retired-state trooper dad who knows a thing or two about cooking a pork shoulder. There is plenty of debate about the right way to cook this (whole hog vs. shoulder, coal vs. gas, etc), but I’d like to think this recipe is authentic enough that Benny’s dad would be proud. 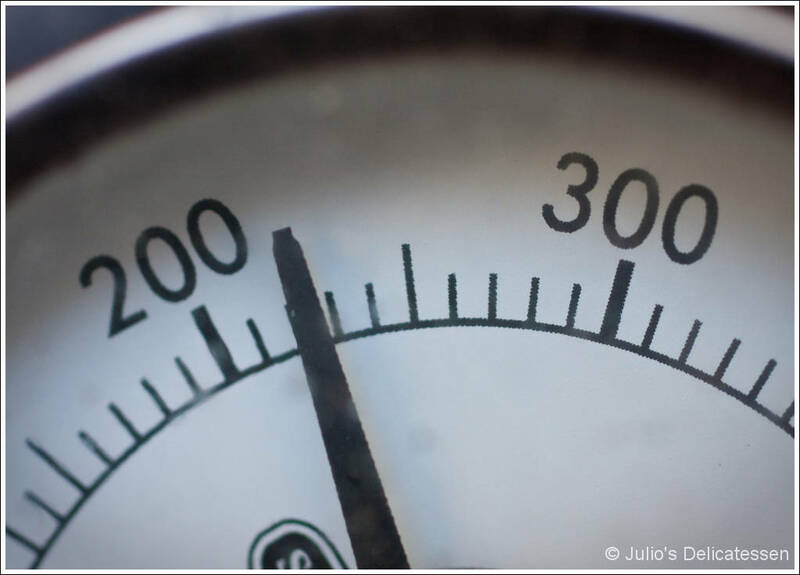 Set your grill or smoker to somewhere between 210 and 230 degrees, ideally indirect heat. Cook the pork until it reaches 190 degrees internal temperature, then let it rest for 30 minutes or so, during which time it will increase to 195 degrees. Baste or “mop” occasionally to add moisture and flavor. The day (or evening) before cooking – make the rub by mixing all of the listed ingredients. Save four table spoons for the mop, and rub the rest into all sides of the meat. Cover the meat with plastic wrap and place in the fridge overnight. Might as well make the sauce and mop at this point, too. 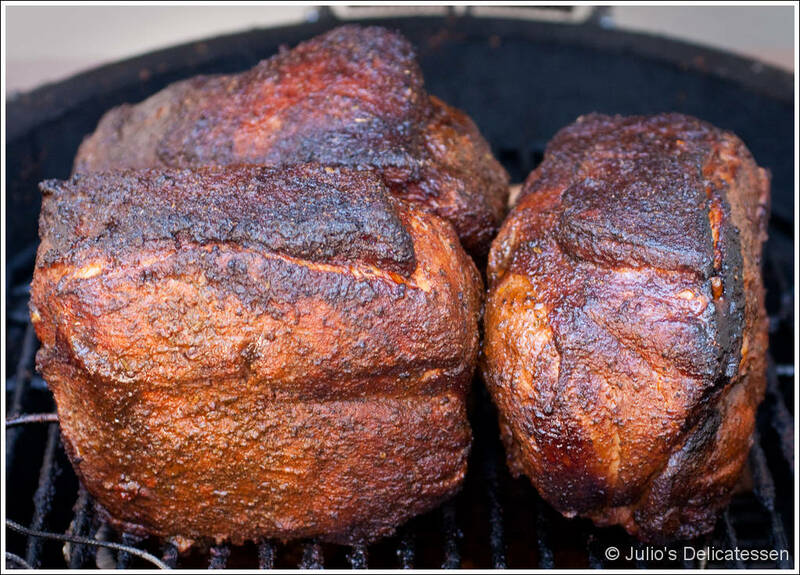 The morning you plan to cook – Set the meat on the counter for an hour or so while you get the smoker ready. Set your smoker for indirect cooking at somewhere between 215 and 235 degrees. Add some chunks of fruit wood (I use apple) and add the meat. Mop every hour and cook until the internal temperature reaches 190. Remove from heat, cover with foil and let rest AT LEAST 30 minutes. Using two forks, your fingers, or whatever else comes to mind, pull the pork into shreds. You can also chop it lightly (some BBQ masters from “down east” serve both pulled and chopped BBQ to cover all the bases). Serve on buns with the sauce on the side. Very proud, indeed. Can’t wait to try this recipe! Tonight we are in the Outer Banks (NC) – Corolla to be more precise, and we just finished an awesome frog moor stew; complete with shrimp, crab legs, kielbasa, red potatoes and corn. I hope you will add a recipe for this awesome feast that has become my new favorite spring/summer meal! the remainder of the drip neighborhood and additionally causing the block. favorite cook, and find the most perfect blends, you should uncover the coffee maker which will . You are so cool! I do not suppose I’ve read through something like that before. So great to discover somebody with a few unique thoughts on this subject. Seriously.. many thanks for starting this up. This website is one thing that is required on the web, someone with a bit of originality! Its like you read my mind! You appear to kknow so much about this, liike you wrote the book in it or something.